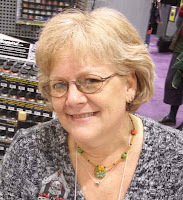 During CHA I had the wonderful pleasure of chatting with Marie Segal (polymer clay artist extraordinaire) whilst she was conducting make and takes at the Rupert, Gibbon and Spider booth. 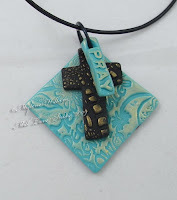 I also got to play with Cernit, the pthalate free polymer clay and create this little piece below. This one is going to my daughter who has joined a youth ministry team for the next 12 months and will be living away from home for the first time...... I'm sad to be letting go of her, but happy knowing that she will be enjoying what she's doing! 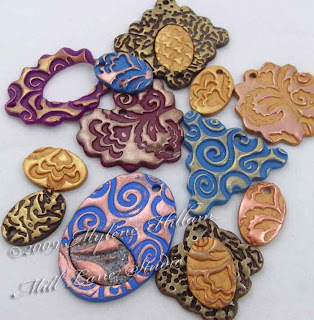 But what I want to chat about today is Marie's very clever word moulds which we used to create the words for the top layer of our pendants. 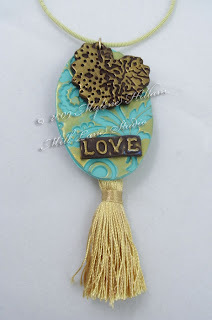 Marie has generously shared her idea and how she created her moulds on her blog here. Do check it out, it's such a neat idea! 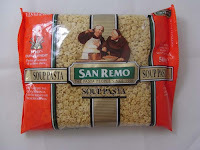 Now if you're in Australia, you're unlikely to find the alphabet noodles that she talks about in the Mexican aisle at your local supermarket but check out the Italian aisle and you might find something like this. You'll have to hunt through the pack, but with luck you'll find all the letters of the alphabet and will be able to make your own moulds. Thanks so much for sharing this with us Marie. 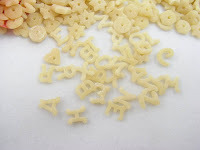 Having found a source of alphabet pasta to work with, I got to work creating some more pendants which are just so easy to do. Marie had us roll out the clay in the pasta machine, texture it with stamps and texture mats and then cut out the shapes using cookie cutters. A light brush with Pearl Ex highlighted the texture nicely. We made holes in the top of each piece for the jump ring and baked them in the oven using the guidelines on the package. Very simple! Here's some I did at home with the polymer clay I had on hand. Next, add a word tile (using Marie's mould making technique) and a few embellishments and here's the finished product! 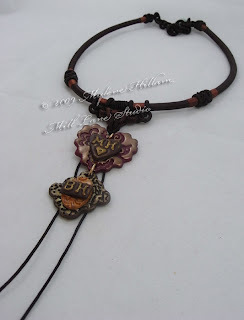 I've made this one into a pendant but I'm thinking it would look lovely as the focal piece on a card front and with Valentine's Day just around the corner I just might convert it to a Valentine's card for my Sweetie! For the one below, I used a choker which I bought some time ago. My original intention was to make it into a tribal necklace but it worked quite nicely with this piece so the tribal piece will have to wait. I'll turn some of the other pieces I've cast into jewellery when I have more time but this has been such a fun idea to play with and I just can't stop saying it, so I'm going to say it again. Thanks Marie! Your work is beautiful, it has an understated and elegant quality to it that is refreshing. Congratulations by the way, on your win in the FP challenge, you deserved it.